Brighten+Balance with pumpkin, honey & more! Autumn Harvest Ritual was designed to soothe, brighten, and rebalance skin thanks to pure honey and real pumpkin, which infuse the skin with nourishing antioxidants. Perfect ritual for fall and the cooler weather that comes with it. 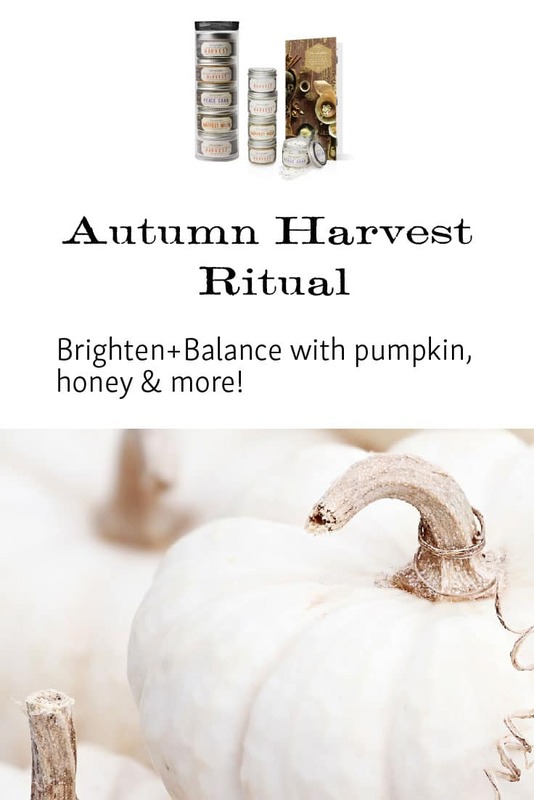 Autumn Harvest Ritual is made with carefully-selected ingredients that are available because of the mighty honeybee. The cooler, dryer air in Autumn often leaves vulnerable skin dehydrated, flaky and fatigued. This ritual leaves your skin nourished, glowing, and radiant. Nourishing plant oils and butters provide moisture to the skin to protect it from dryer air. Real pumpkin pulp, clays, ground walnut shells and honey all contribute to cleaner, healthier and brighter skin. Harvest Pumpkin Butter: warm, rich, and soothing natural plant butters and essential oils to soothe skin. Harvest Mask: clays, oats, honey and pumpkin pulp purify the skin. 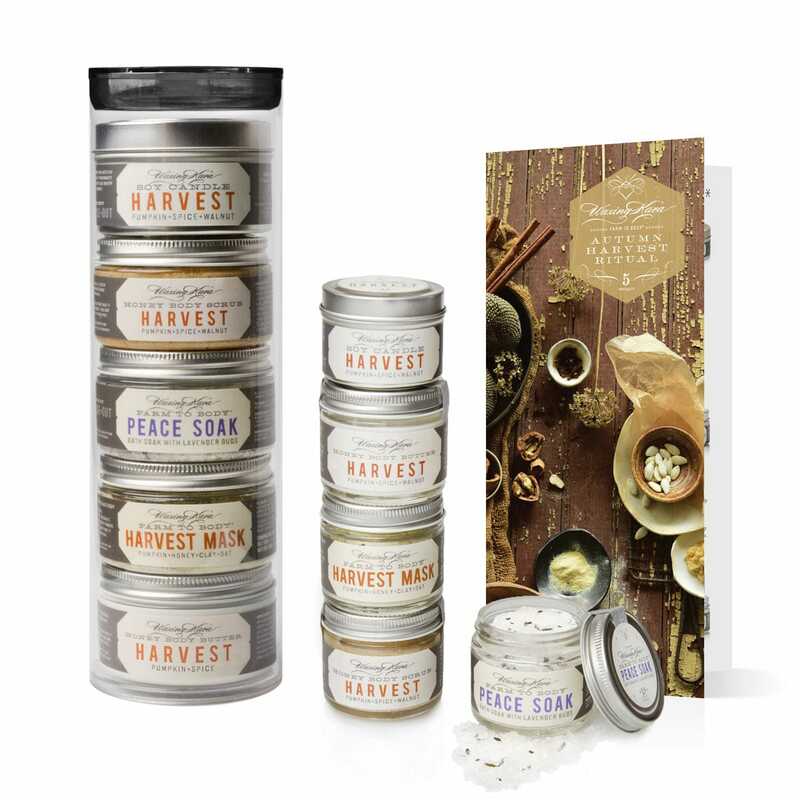 Harvest Pumpkin Scrub: organic honey crystals, organic sugar pumpkin pulp and ground walnut shells cleanse and renew dry skin, leaving it fresh and new. Harvest Candle: a warm blend of pumpkin, spice, and walnut to warm your heart and your home. Celebrate the season and vibrant Bee Inspired® skin. Step 1 – Dry Brush the skin. Step 2 – Soak in warm water enriched with Waxing Kara® Peace Soak. Sodium and potassium levels are well-kept secrets to both physical health and mental well-being. They influence the fluid balance in the body, which is regulated by the Adrenal gland, which in turn affects the healthy function of the kidneys. A far-reaching domino effect is ignited in the body when sodium and potassium levels are skewed. Soaking in Dead Sea Salts helps restore balance, fortifying your well-being as they coax you into relaxation. Directions: We recommend 2 scoops for an average-sized bath, and 6 scoops for an over sized tub. Simply scoop and then swirl salts into warm water. Step 3 – Cleanse and exfoliate with Waxing Kara Harvest Scrub. Our Harvest Scrub combines both honey and sugar crystals with the natural enzymes in pumpkin pulp and pumpkin seed oil to dissolve dull cells. The result? Brighter, fresher skin. Ground walnut shells softly exfoliate as the aromas of warm clove and cinnamon envelope you in cozy comfort. Step 4 – Repair with Waxing Kara Harvest Mask made with pumpkin + honey. This innovative powdered mask is brimming with beta carotene, natural enzymes and minerals designed to gently cleanse, nourish and fortify the skin as gentle clays vacuum environmental pollutants from the pores, leaving skin profoundly refreshed. Directions: Quickly blend a fresh, 100% natural mask targeted to your skin type. Select a mixer after examining the skin- mixing takes 60 seconds or less. Combine 2 parts mask powder to 1 part mixer and blend well. Step 5 – Massage freshly cleansed skin with Waxing Kara Harvest Pumpkin Body Butter. Lock in all the goodness of this farm-to-body treatment with our decidedly rich (yet impossibly light!) body butter. Waxing Kara honey, coconut oil, and cocoa butter deeply condition skin so you feel moist and smooth, sassy and sweet! Step 6 – Relax pour a cup of herbal tea and sweeten with Honey. Light the Harvest Soy Tin Candle. Listen to inspiring music. Relax your body and mind.